A North Carolina-based collaboration between a marine scientist and a commercial fisherman, Sandbar Oyster Company has developed a revolutionary approach to growing oysters, building oyster reefs and protecting shorelines. Our world is warming and sea levels are rising, causing the shores of our estuaries to rapidly erode. Global sea level rose 7 inches over the 20th century. Over the past 6 years, sea level rose 6 inches along Southeast U.S. shores (https://tidesandcurrents.noaa.gov/slregional). Bulkheads and seawalls -- the current “go-to” protection technology -- destroy natural habitats, often fail under stress and are expensive. Shoreline owners and coastal managers are seeking effective protection that is affordable and nature-friendly. Our patent-pending, biodegradable hardscape creates oyster reefs and salt marsh habitat that we combine to form “living shorelines” that provide exceptional erosion control and essential fish habitat. 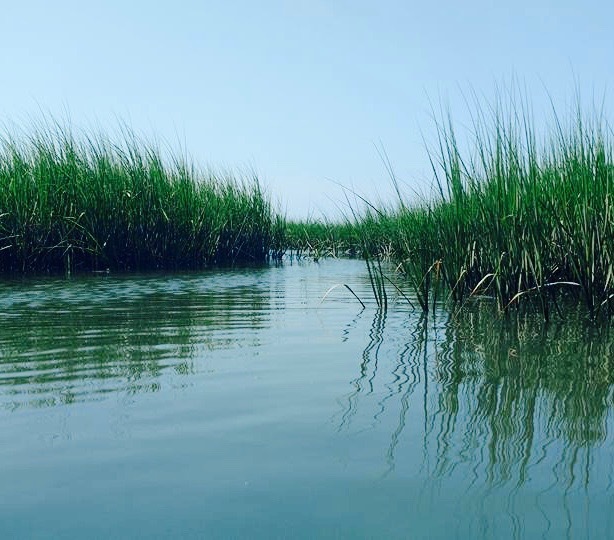 A key focus of SANDBAR’s business is the preservation, restoration and de novo creation of oyster and salt marsh habitats. With Oyster Catcher™ and other SANDBAR products, one can create intertidal oyster reef and salt marsh habitat that protect estuarine shorelines and support the progressive regrowth of oyster reef/salt marsh complexes over nearshore bottom they previously occupied. Further, where conditions permit, SANDBAR’s Oyster Catcher™ products and restoration strategies can create subtidal oyster reefs for harvest and provide other ecosystem services, including enhancement of multiple estuarine-dependent fisheries species, shoreline protection and improved water quality. SANDBAR is bringing innovation and core sustainability to oyster aquaculture by offering forms of Oyster Catcher™ and know-how to produce large quantities of seed oysters derived from the natural spawning of wild oysters. The offspring of these genetically diverse parents possess traits favorable for survival and growth across a wide range of environmental conditions. Forms of Oyster Catcher™ optimized for spat collection can be used in hatcheries or appropriate natural environments as a biodegradable oyster shell substitute. Oyster Catcher™ is our patent-pending biodegradable hardscape composed of plant-fiber cloths and a mineral-based hardening agent. After passing the cloth through a slurry of the binder, we wet form a wide-range of modular shapes designed for the creation of living shorelines, oyster-habitat restoration and oyster aquaculture. SANDBAR holds the exclusive, world-wide license from UNC Chapel Hill to commercialize Oyster Catcher™ and related derivatives of the biodegradable hardscape for living shoreline creation, oyster and salt marsh habitat restoration and oyster aquaculture. Patent applications have been filed in the U.S., Australia, New Zealand, Canada and Europe.